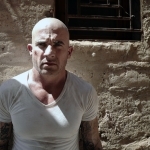 Prison Break: Resurrection 5.4 “Prisoner’s Dilemma” review: Lincoln is by Sheba’s bedside. She’s still worried about the passports. C-Note tells Lincoln that they have to leave Yemen, “ISIL are taking neighborhoods by the hour.” Lincoln will not even consider it without Michael. Sheba’s grateful dad has a judge friend that may be able to help. They drive through a broken and terrorized city. The judge gives them a full pardon for Michael. Is it too late? Michael is in solitary with Ramal, Whip, and Ja. Unfortunately, the cell he needs contains the leader of ISIL. He warns that when his men get there, “All of you will be put down like the dogs that you are.” Michael is losing it. T-Bag (Yay! Robert Knepper!) is on Poseidon aka Kellerman recon. He visits his home and gives him a nice punch as payment for locking him up while the others went free. T-Bag wants to know every single detail. Kellerman tells him he got it wrong, and gives him some Poseidon intel: “An operative so deep, so untouchable, you couldn’t find him with a nuclear sub.” He tells T-Bag that Scofield is dead if he’s tangling with Poseidon. 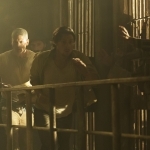 Lincoln gets to the prison just as the guards abandon it. He runs in as everyone runs out. But he has to run back after the guard with the keys after he locks everyone in. ISIL kills the guard. Cross (T.J. Ramini) gives a William Wallace speech to the prisoners – take Ramal prisoner and kill “Kaniel Outis.” Ramal rethinks his answer to Michael. A spoon and a string and a pipe – Scofield IS MacGyver. Whip tries to hurry them up, “It’s a freakin’ Mexican soap opera out here!” Ramal opens Michael’s door and he keeps his word. Ramal is his insurance. The prisoners break through, but the cells are empty. The group finds a phone and Michael tells Ramal to call and get them “safe passage.” The prison is a maze. They are finding it quite difficult to escape, although there are no guards and they are not locked in cells. Just as Cross gets near them, Sid stabs him in the neck (he had threatened and beat him earlier). They climbed over the roof and out of the prison, just as Lincoln gets in. The assassins come and kill Kellerman, but not before he plants the seed of suspicion in one of them. T-Bag calls the cops. Everyone escapes before they come (except poor Kellerman). He follows the pair to a meeting, and you will be surprised who they meet. I screamed. Ja stops for food, and Michael loses his temper pushing him down and kicking him out of the group. It’s a fake out. Ramal and Michael trick each other. Ramal is about to behead Michael when Lincoln shows up. They are at an impasse, but Whip manages to stab Ramal and Lincoln shoots the men. They have about 10 seconds before more ISIL comes upon them. They find a place and Lincoln and Michael have a tearful reunion. I got teary too (even though they are together every week on Legends). They see the broadcast of Ramal being martyred. All of ISIL is after them now. Yikes! The formula just works. Last minute life and death situations, impossible spur of the moment inventions, And never really knowing if the good guys are good, and the bad guys are all bad is what made the former incarnation, and what makes this one so much fun. I can NOT believe the reveal at the end! So good! – Apparently the writers take my advice, because Knepper was a good chunk of the episode. – I did like Kellerman. Too bad he had to die. – Prison Break did it! They surprised me. I did not expect that, but am happily surprised. – No Sara this episode, but expect her to be front and center next week. – Why can’t they just continue after this season? 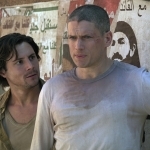 As Michael’s plans to execute the perfect escape go awry, Lincoln makes one last-ditch effort to save his brother, leading to an epic confrontation between good and evil in the “The Prisoner’s Dilemma” episode of PRISON BREAK airing Tuesday, April 25 (9:00-10:00 PM ET/PT) on FOX. Michael, Whip and Ja make their last attempt to break out of Ogygia, but in order to do so they must make a deal with the devil.